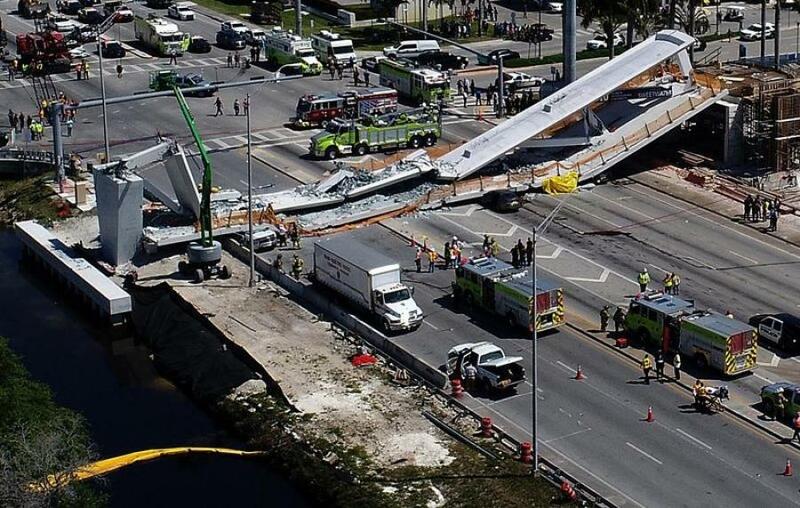 Federal investigators looking into the collapse of a pedestrian bridge in Florida that killed six people earlier this year confirmed May 23, 2018, that they are focusing in part on the emergence of cracks in the structure before the accident. The National Transportation Safety Board (NTSB) released a preliminary report light on details but that suggested investigators are focused on cracks in the south and north ends of the bridge near a Miami-area university campus. The cracks were discovered in the days before the March 15 collapse, which killed a bridge worker and five people in vehicles crushed by the falling structure. Photographs released by NTSB noted three cracks in the north end of the span, where crews were working on tensioning a structural component of the crossing when the failure occurred. A crew was on the bridge working on the diagonal beam at the time. When completed, the bridge was to span a busy highway and canal and connect Florida International University's campus to the neighboring community of Sweetwater. When the bridge fell, construction was behind schedule and millions over budget, in part because of a key change in the design and placement of one of the span's supports, public documents showed. The NTSB's preliminary report did not reveal a probable cause in the accident, and the agency said it is still examining several bridge structural components and testing various other pieces.